AAIS’ President Mr Charles Chong. Mr Chong gave his heartfelt thanks to Mr Fergus D. Lopez, Ms Angeline Bilodeau, Mr Chris Davie and Mr Ng Kim Keng who have stepped down from the Management Committee. He presented a token of appreciation to Mr Lopez, who had been AAIS’ Honorary Secretary since 2005, for his dedicated and committed service. He also announced that AAIS had recovered from a position of deficit and achieved a significant boost in its financial standing, which the Association will continue to serve its members and aerospace organisations through the development of enhanced services. Mr Adrian Plevin, AAIS’ Assistant Honorary Secretary, conducted a presentation on the developments and activities of AAIS for the previous financial year. Certificates were subsequently presented to the new members of AAIS and the three and five year Long Service Awards were presented to Secretariat staff. The Singapore AeroIndustry Annual Meeting (AIAM) 2014 was held after the AGM. 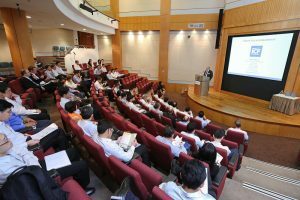 The event brought the aerospace industry together for a day of senior-level knowledge-sharing and networking, providing participants with useful information and ideas to implement in their respective organisations. Mr David Stewart, Vice President of ICF International, presented on the Competitiveness Assessment for Singapore’s Aviation MRO Industry. Appointed by AAIS, ICF International was the consulting firm to undertake the study, which aimed to gauge Singapore’s MRO competitiveness and to identify specific key capabilities and infrastructural gaps that need to be filled for the successful development of Singapore’s MRO industry. Mr Stewart also shared on the outlook of the Asia Pacific MRO market in 2015. 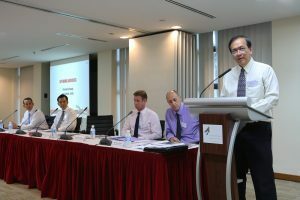 Dr Yip Yuen Cheong, Executive Vice President, Aerospace Engineering & Manufacturing of ST Aerospace, presented on the changing competition in the global aerospace market and what that means for companies in Singapore. The event was concluded with a presentation by Mr Soh Chee Siong, CEO of JEP Precision Engineering, who shared on staying relevant and competitive in the global market.